Today all sections and units of Dolmabahce Palace are restored and opened to visit. The Dolmabahce Palace Complex is administered by the National Palaces Trust under the TBMM ( auspices of the Turkish Grand National Assembly ); and it is open to visitors, except Mondays and Thursdays daily between 09:00 - 16:00. It is one of the most important historic places in Istanbul that must be seen. This Palace is one of the most fascinating palaces in the world built in 19th century, Ottoman architecture and it was located in an area of 110 thousand squaremeters. It is located along the European shore of the Bosphorus between the ports of Besiktas and Kabatas. The plan arrangement of Dolmabahce Palace is an adaptation of traditional Turkish house in grandeur scale, constructed with brick internal walls, stone external walls and timber floors. After your visit with the breezes in the halls of the palace, it will be a great pleasure for you to rest at the cafe in the garden and have a cup of coffee with the fascinating Bosphorus scene. If you have a chance to visit Dolmabahce Sarayi in June, you'll get fascinated by the glory of magnolia trees. Dolmabahce means “Filled up Garden”. Until 17th Century this site was one of the bays in Bosporus. This bay was a natural harbor. Beginning from the XVII the Ottoman Admirals anchored the naval fleet here and also the traditional maritime ceremonies had taken place in this harbor when the Ottomans conquered Istanbul. In centuries, it had been started to be filled up time to time and became one of the unique gardens of Bosporus called Dolmabahce. The construction of the Palace completed in 13 years and cost five million Ottoman gold pounds (the equivalent of 35 tons of gold). Sultan Abdülmecit I, who was the 31st sultan of the Ottoman Empire, commissioned the construction of the palace. This marvelous palace displays the power and richness the Sultans had. For the Ottoman treasury this palace was an unnecessary expenditure and because of the external debt, it had become totally empty. This palace had been empty intermittently for 32 years since the collapse of the Ottoman Empire. In Dolmabahce Palace the last 6 sultans and Caliph Abdulmecit lived and after him most of the subsequent sultans preferred to live in the smaller palaces that they had built on their own along the Bosphorus. This palace was used also by Ataturk with the declaration of the republic. When Ataturk visited Istanbul, he used Dolmabahce Palace as his residence. On 10th of November 1938 Ataturk passed away in this palace after a long period of sickness and then it was converted in to a museum. Dolmabahce Palace is a blend of many European architectural styles. It is the most western and the newest of all. Dolmabahce Palace, the monumental example of the Ottoman capital city, influenced by the widespread aesthetical approaches of the dominant European architecture at that time, comprises many characteristics of the Ottoman palace architecture tradition. It was built between 1843 and 1856 by Karabet Balyan, the best-known member of Armenian architect family, the chief architect of Sultan Abdulmecit. The three-storied palace, including the basement floor, built on a symmetrical plan and there is 45 thousand squaremeters of usable floor area so it has 285 rooms and 46 halls, 6 Turkish baths, 1427 windows, 68 toilets and carpets covering a floor. The facade of Palace stretches for 600 meters along the European shore of the Bosporus. It has survived intact with its original decorations, curtains, furniture, silk carpets and everything else. It consisted of sixteen separate sections besides the main structure such as palace stables, mills, glass shop, foundry, pharmacies, kitchens, aviaries, patisserie shop. There are two monumental gates ( The Treasury Gate faces the Clock Tower, and the Regal Gate faces the main roadway one of which is very ornate (the one on the land side) and there is a 600 meter-long quay along the sea. The marbles were brought from the Islands in the Sea of Marmara, The porphyry stones from ancient Pergamon city, the alabaster from Egypt, the furniture was brought from Paris, the crystal materials from Baccarat, the vases from Sevr, the canslesticks from England, the silk carpets from Hereke and Lyon with special order. Almost all of 99 small and 131 large hand made carpets are silk and all they were woven in the royal workshops in Hereke. 4.500 square meters area covered by the carpets. It is said that 40 tons of silver and 14 tons of gold were used for the decoration of the palace. The interior of the Dolmabahce Palace was decorated with the paintings; and ceiling illustrations were made by French and Italian artists. And also a lot of paintings by famous Russian painter Aiwazowsky enriched the interior decoration of this palace. In the interior decoration, 156 clocks, 58 candlesticks and 280 vases, most of which were placed symmetrically, were used. 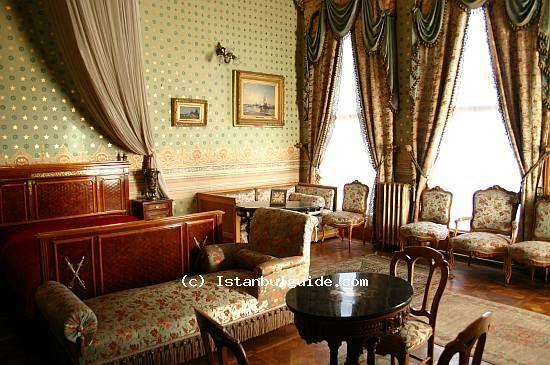 During the years 1910 – 1912 Dolmabahce Palace received its central heating and electrical systems. The clock tower and the lodges were added during the reign of Sultan Abdülhamid II (1876 - 1909).